Here I am going to share the testimonial of Vijay Pratap, who had undergone Post Graduate Diploma in Patent Law and Management from IIPTA. He is sincere and diligent individual with a degree of B. Tech in ECE. Working as Patent Trainee at Indian Institute of Patent and Trademark. Exhibits strong credentials to understand organizations objectives and requirements and thereby develop specific success metrics as well as design reporting and analysis approaches tailored to their unique needs. Possesses thorough understanding of patent language and scope of patent claims, according to country specifications. Understanding of all aspects governing operational and production activities and up to date knowledge of latest technological advancements, regulations/ guidelines and statutory compliances in the industry. He believes in thriving in a deadline intensive environment, multi-task, perform under pressure and meet deadlines. He possesses ability to use sound judgment & decision-making skills and effectively perform in a self-directed environment. He has a good analytical, communication and presentation skills. His Present Engagement in Videojet Technology India Pvt. Ltd. Working as Service Engineer at Videojet Technologies India Pvt Ltd from Jan 2016 to Nov. 2017. Videojet Technologies Inc., the company provides the right coding and marking solution through the broadest range of technologies, and is committed to providing quality equipment, supplies, and service designed to perform with maximum reliability, efficiency, ease of operation and little maintenance. Videojet large and small character inkjet printers, laser coding systems, thermal transfer printers and labelling equipment apply variable data such as best-by dates, production date, lot number and operator information, as well as linear and 2D bar codes onto virtually every possible product packaging, shipping container or pallet. With more than 325,000 units installed worldwide, Videojet has over 3,500 employees in 30 direct operations around the world. Our global network of sales and service centres provides all regions with high quality service. 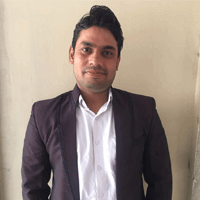 Vijay has this classroom program from IIPTA and was very much satisfied after the classes which he undergoes under Patent Agent Mrs. Cheshta Sharma. He understood everything very well, and moreover was very much clear about the Program. He also got selected for the Internship process in IIPTA.